Niche Audio is the new label for producers looking for top flight mix ingredients and perfectly processed Maschine and Ableton Live expansion packs. Available in contemporary styles and genres, the packs are mixed and engineered with precision, allowing you total flexibility and inspiration to take your music to the next level! Focusing on one shot drums, bass, music and fx packs – Niche Audio delivers custom built kits within each native software instrument, including project files, patterns and the one shot samples themselves to give you perfect flexibilty and inspiration every time. Our royalty free samples have been carefully selected for maximum authenticity and we use only the very best studio equipment and seasoned producers and audio engineers for our projects. 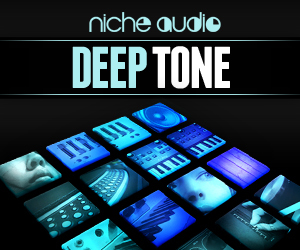 Deep Tone has plenty of Fat Kicks, Crisp Snares, Cool Chords, Glitched Vocals, Sub Tones, and Smooth Pads within its 13 perfectly mixed Kits, and also includes 1 Special FX kit, and an additional Synth Kit. Each Kit has been created from scratch in both Maschine and Ableton Live formats to maximize the use of onboard effects, compression and usability, creating some of the most flexible and inspiring expansions for these DAW’s yet to be heard. Expect to find 13 Kits with 16 samples in each, including Cool processed Drums, Omni Percussion, Smooth Pads and Chords, Subsonic Basses, Glitched Vocals and Special FX, combining to create a unique and involving sound palette which inspires and excites. Also included are 2 additional special kits which feature exquisite Synth Tones and Special Fx samples for additional sample layering. Project files are included with patterns for each kit demonstrating the balance and combination of sounds that can be achieved, and to act as a starting point for your productions. Each Kit features subtle mix and fx customization to maximize its playability whilst maintaining its balance in the mix and will work perfectly with other external ingredients to create a fantastic track. 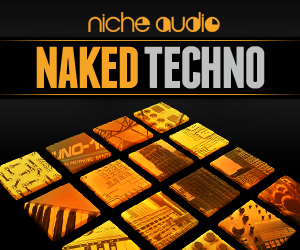 “Naked Techno” – an authentic collection of 15 professionally engineered, mixed and produced Techno kits inspired by three decades of the best melodic Detroit and European Techno. Project files are included with patterns for each kit demonstrating the balance and combination of sounds that can be achieved, and to act as a starting point for your productions. Each Kit features subtle mix and fx customization to maximize its playability whilst maintaining its balance in the mix and will work perfectly with other external ingredients to create a fantastic track.